I’m going to be totally honest with you and hope that Texas doesn’t revoke my citizenship, and that I don’t lose my Official Redneck status. 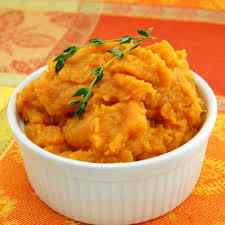 I don’t like sweet potatoes. I’ll give you a minute to get over that. So… I know, right? A died-in-the-wool, seventh-generation Texan not like a Southern Staple like the sweet potato? I don’t know how it happened. It might be that one of my German genes is upset with the idea. Whatever it is, I just can’t seem to enjoy them. Those are both wonderful, pertinent questions, worth of a good answer. I commend you for your focus and attention to detail. Here’s the thing: I’ve done quite a few Winter Feasts over the years. And while I may not care for orange potatoes, I know a LOT of people who do. And I don’t want to disappoint them. 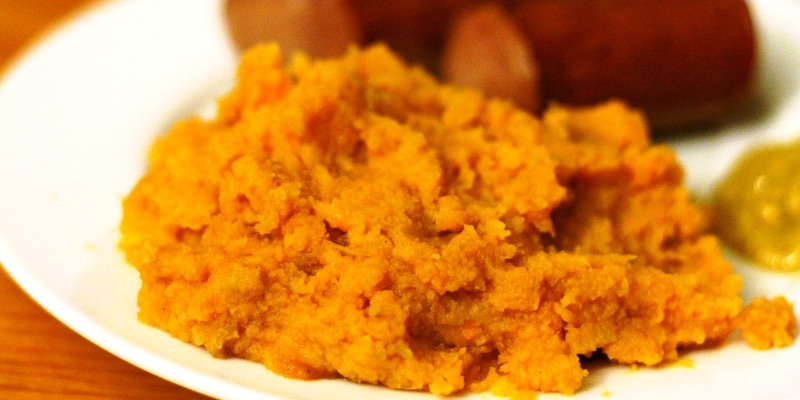 So I learned how to make a few different sweet potato recipes a while back. Since I wasn’t a very good taste tester, I had to enlist friends, girlfriends, (ex-)wives and family members. Once I had a recipe that everyone loved, I tasted it so I could recreate it time and again. 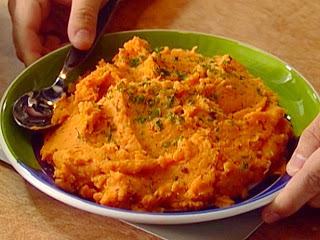 I can still taste the sweet potato, but even for me, it’s pretty darn good! And here we are, about to mash up some orange potatoes and turn them into something at which to marvel. Let’s go have some fun! If you’re doing a “normal” style of mashed potatoes, peel your potatoes and cut into chunks. If you prefer to do “rustic,” skin on potatoes, scrub them, then cut them up. Cook sweet potatoes in boiling water until tender. Drain and put in the bowl of your stand mixer, or a large bowl. Mash the potatoes until fairly smooth. Add salt, butter, and maple syrup. Add cinnamon to taste then continue to mash again. Add cream or half-and-half a little at a time until you achieve the desired, creamy-yet-firm consistency. For this recipe, I strongly recommend real butter and pure maple syrup. You will be far more pleased with the results than if you use substitutes. I suggest you begin with 1/4 teaspoon of cinnamon and adjust from there until you know how much you like to use. Remember: you can always add more, but you can’t take it back out. 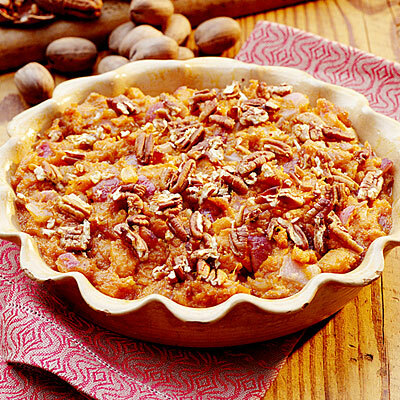 An easy upgrade is to roughly chop some pecan halves and sprinkle them over the potatoes. You could also add the pecans to the syrup you drizzle over the top, or put just coat the pecans in syrup. A neat presentation idea is to warm some extra syrup (with just a touch of butter) and drizzle a bit over the top just before you serve. If you make them ahead of time, you can warm them in the oven with some foil over the top. If you like, finish them off under the broiler to brown them on top. I have more Potato Recipes here. Did you like this recipe? What recipes would you like to learn? Leave me a comment and tell me your thoughts! (And don’t forget to LIKE this post!) Share it using the tiles below. 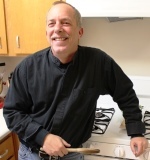 Lane Baldwin is a an internationally-acclaimed singer, songwriter, author and food lover. He wasn't trained in France, and he doesn't have his own TV show. He just loves to cook, and loves sharing what he's learned over the years. In his "real life," Lane has toured the world, bringing his special brand of Blues-infused Americana to millions of fans. At home he leads a quiet life filled with good books, good food and good friends. I'm Lane Baldwin - a professional musician, songwriter and singer, writer and speaker, and amateur cook. Cooking is easy. If I can do it, so can you! And I'll show you how. Read more. Help Keep the Kitchen OPEN! 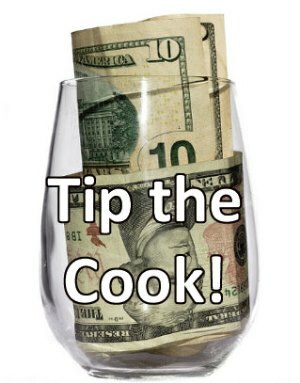 All donations of $10 or more will receive 101 Manly Kitchen Tips PDF book FREE! Bass Lessons HQ Lane offers FREE video bass guitar lessons. Lane Baldwin Lane’s main web site focuses on his music career. Life with Spirit The Life with Spirit Foundation focuses on Lane’s charity work and spirituality. Servant-Leadership Solutions Lane is an internationally-known author and speaker on servant-leadership and service-based sales.